"Right now we don't know if the methods they employ are, or are not, going to have a catastrophic failure," says Robert Santos, chief methodologist at the Urban Institute, a nonpartisan think tank. "The vast majority of social scientists would say these volunteer polls have no reason to be right," says Robert M. Groves, provost of Georgetown University and a former director of the U.S. Census Bureau. "They have no theory behind them at all." Such arguments nag at Andrew Gelman, a professor of statistics and political science at Columbia University. "There's a reason why people aren't sticking with the old stuff," he says. Every survey now requires massaging data to account for low response rates; the ideal poll no longer exists. Researchers need new methods, he says. "Traditional polls are not so wonderful." This simmering debate popped into public view this month, when the American Association for Public Opinion Research, the discipline's professional body, sent a letter to The New York Times warning against its recent use of online surveys. The letter was broadly written and seemed to indict the whole discipline of online polls. Members of the association's email list were soon in a furious internal debate, and Mr. Gelman prominently criticized the statement. The association's president, Michael W. Link, regrets some of the language chosen for the letter. It was meant as a caution to the public—especially news outlets—and not as a condemnation of the research, he says. "Maybe the statement could have been a little clearer." However it was meant, the letter highlighted the curious state in which survey research finds itself. As Mr. Groves has written, if there were a war between our guts and our statistics, the quants have won. Data are the currency of business, government, science, even higher education. There has never been more interest in polling; following Nate Silver, the media have rowed toward data analysis. The truth, if it can be found, simply must be hidden among those numbers. Yet at this moment of demand, polling is in crisis. The costs have spiraled out of control. The public is harder than ever to reach. Landlines are dwindling, and rare is the person who takes an unknown call on her cellphone. Robocalls and junk polls clog the air. We all want to know what the public thinks—but who has the time to talk? There is lots of good stuff in the rest of the piece. I've used data collected by, in order of how much the data costs, Knowledge Networks, Online Survey Solution and SurveyMonkey (who bought Zoomerang). I endorse the first two but won't use SurveyMonkey's panel again (at least for surveys with hypothetical questions, I've presented a telephone vs. mail vs. online panel paper at a couple of conferences that explains why). I'm involved in data collection using the ridiculously cheap Mechanical Turk this summer, but I haven't seen the results yet. I've also heard good things about Survey Sampling's panel. And today, I'll be in the field supervising an in-person survey of people lined up waiting to get in to the High Country Beer Fest. We have a 5 question postcard survey to pass out where the main question is something like, if the ticket cost $X instead of $40 would you still have shown up today? And in about a week, we hope to survey those who bought their tickets online. I've done a bunch of these tourism event surveys and have always gotten a good response rate. I'm a "hackademic," what are you? I'm a meat eater but this place is good. Oh, and have you tried the Green Man? With the start of the autumn 2014 semester, the university adds a new housing learning community focused on sustainability to its diverse living options for new and returning students. The university offers its students more than a dozen learning communities, which are comprised of groups of students who live together on a residence hall floor who have common majors, career aspirations or personal interests. SUSTAINS (Students Understanding Sustainability and Taking Action to Improve Nature and Society) is targeted at undergraduates studying or interested in the environment and focuses on helping students to explore and engage with sustainability topics and investigate human interaction with environmental problems. "2014 Update: Grading Economics Textbooks on Climate Change"
With a new school year approaching, this is a good time to update our review of the treatment of climate change in economics textbooks. As in our 2010 and 2012 reviews, some books hit the mark while others are wildly misleading. But we’re happy to say that there’s plenty of good news, especially at the top and the bottom of the grade distribution: the good books have gotten better (including the first-ever A+ grade!) and even the worst ones have made improvements (the lowest grade is now a D-, not a F!). Some books, of course, suffered some backsliding. Out of 18 books reviewed, four still make the “Not Recommended” list, with the biggest loser being Gwartney, Stroup, Sobel, and Macpherson’s Economics: Private and Public Choice (15th ed. ), hereby dubbed the recipient of the undesired 2014 Ruffin and Gregory Award for the Worst Treatment of Climate Change in an Economics Textbook (so named for a comically bad treatment of climate change in a textbook now thankfully out of print). The course is for senior economics majors, MBAs and graduate students from other programs. My reading list includes BCA examples, overviews, technical stuff (in mostly non-technical language) and other stuff. Allen, Bryon P., and John B. Loomis. "The Decision to use Benefit Transfer or Conduct Original Valuation Research for Benefit-Cost and Policy Analysis," Contemporary Economic Policy 26, no. 1 (2008): 1-12. Atkinson, Giles, and Susana Mourato. "Environmental cost-benefit analysis. "Annual Review of Environment and Resources 33 (2008): 317-344. Banzhaf, Spencer H. "Consumer surplus with apology: a historical perspective on nonmarket valuation and recreation demand." Annual Review of Resource Economics 2, no. 1 (2010): 183-207. Barget, Eric, and Jean-Jacques Gouguet. "The total economic value of sporting events theory and practice." Journal of Sports Economics 8, no. 2 (2007): 165-182. Blomquist, Glenn C. "Self-protection and averting behavior, values of statistical lives, and benefit cost analysis of environmental policy." Review of Economics of the Household 2, no. 1 (2004): 89-110. Blomquist, Glenn C., Paul A. Coomes, Christopher Jepsen, Brandon C. Koford, and Kenneth R. Troske. "Estimating the social value of higher education: willingness to pay for community and technical colleges." Journal of Benefit-Cost Analysis 5, no. 1 (2014): 3-41. Cohen, Mark A., Roland T. Rust, Sara Steen, and Simon T. Tidd. "Willingness-to-pay for Crime Control Programs,” Criminology 42, no. 1 (2004): 89-110. Farrow, Scott. "How (Not) to Lie with Benefit-Cost Analysis." The Economists’ Voice 10, no. 1 (2013): 45-50. Graves, Philip E. "Benefit-Cost Analysis of Environmental Projects: A Plethora of Biases Understating Net Benefits." Journal of Benefit-Cost Analysis 3, no. 3 (2012). Griffiths, Charles, Heather Klemick, Matt Massey, Chris Moore, Steve Newbold, David Simpson, Patrick Walsh, and William Wheeler. "US Environmental Protection Agency valuation of surface water quality improvements." 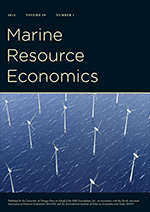 Review of Environmental Economics and Policy (2012): rer025. Loomis, John B. "Incorporating distributional issues into benefit cost analysis: why, how, and two empirical examples using non-market valuation." Journal of Benefit-Cost Analysis 2, no. 1 (2011). Rhodes, Raymond J., John C. Whitehead, and T.I.J. Smith, A Benefit-Cost Analysis of a Red Drum Stocking Program, unpublished paper presented at the 2006 Southern Economic Association Meetings, Charleston, SC, November. Richardson, Leslie, Tatjana Rosen, Kerry Gunther, and Chuck Schwartz. "The economics of roadside bear viewing." Journal of environmental management140 (2014): 102-110. Robinson, Lisa A. "How US Government Agencies Value Mortality Risk Reductions." Review of Environmental Economics and Policy 1, no. 2 (2007): 283-299. Sunstein, Cass R. "The Real World of Cost-Benefit Analysis: Thirty-Six Questions (and Almost as Many Answers)." Columbia Law Review (2014): 167-211. Van Houtven, George, and Maureen L. Cropper. "When is a Life Too Costly to Save? The Evidence from US Environmental Regulations." Journal of Environmental Economics and Management 30, no. 3 (1996): 348-368. Vitaliano, Donald F., “Repeal of Prohibition: A Benefit-Cost Analysis,” Contemporary Economic Policy (2014). And no Tim, I'm not going to add Haab and McConnell. No one in my family believed me.